I Want a Second Spring Day. November. 09, 2004 23:17. by Sun-Woo	Kim sublime@donga.com. On the afternoon of November 9, a flock of 300 reporters crowded the Grand Hyatt Seoul Hotel ballroom where a production presentation and press conference of a new SBS television drama Spring Day was taking place. It was because A-list celebrity Goh Hyun-jung was making her first public appearance in 10 years at the age of 33 as the leading actress of the new drama. Wearing a white dress with a black jacket and letting her long straight hair flow loose, Goh Hyun-jung flashed sunny smiles throughout the interview, chuckling as she said leisurely, Seeing all these reporters makes me feel like Ive been secretly dating a boyfriend and finally got the families permission to meet, before answering questions. Below are the questions and answers exchanged during the interview. ―Is there a particular reason you chose Spring Day over many other casting offers? ―Do you feel pressure in facing a comeback after 10 years? ―When did you decide to make your public appearance and why did you chose to star in a drama, and not a movie? Former Miss Korea runner-up Goh disappeared from the entertainment business after her marriage in May of 1995, and she divorced her husband in November of 2003. Regarding questions about her children, Goh answered, I have a mothers heart, and I cant just erase those children. But I think it would be better to talk about that in a private meeting. An emotional pause ensued as Gohs face contorted with the effort to swallow her tears. Spring Day is scheduled to air on January 8, 2005. 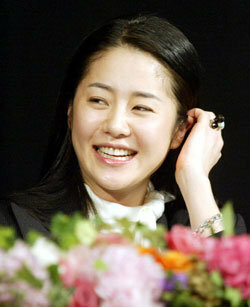 Goh Hyun-jung plays a woman in her late twenties, caught in a love triangle between Cho In-sung and Ji Jin-hee.